Simon & Schuster/Paula Wiseman Books, 9781481472500, 40pp. Owl has a balloon. Monkey does not. What will happen next? Hint: this is not a book about sharing. Owl has a red balloon. Monkey does not. “That red balloon matches my shiny red tie,” says Monkey. “I’d look fancy walking to school with a shiny red balloon. The only thing I’ve ever wanted, since right now, is a shiny, big red balloon. It would make me SO HAPPY!” But Owl does not want to give it to him. So Monkey tries to find something that Owl wants: a teddy bear, a robot, a picture of TEN balloons. Owl does not want any of these things. But then, Monkey offers him…a sock! Hmmmmm…Owl is intrigued. Will he trade his shiny red balloon with Monkey? Ariel Bernstein is very good at sharing. As long as it’s not movie popcorn and M&M’s. She is the author of I Have a Balloon (which received starred reviews from School Library Journal and Kirkus Reviews and was a Junior Library Guild Selection) and Where Is My Balloon? She lives in New Jersey with her family, many mismatched socks, and the occasional balloon. Learn more at ArielBernsteinBooks.com. Entertaining and the ending is humorous. . . . A definite purchase that will be checked out again and again. 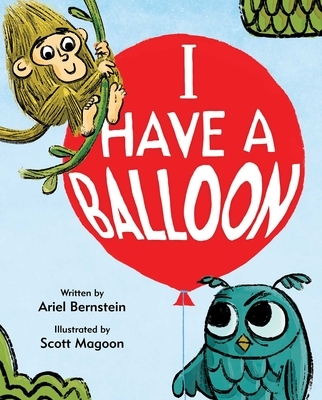 An owl and a monkey confront jealousy, the fickleness of want, and the influence of other perspectives in this high-energy story from debut author Bernstein and illustrator Magoon (I Will Not Eat You). Swinging into the opening scene on a vine, Monkey is enraptured by the red balloon Owl is holding. Initially, Owl seems ambivalent about the balloon, but Monkey’s praise (“The only thing I’ve ever wanted, since right now, is a shiny, big red balloon”) leaves Owl unwilling to part with it, despite Monkey’s offers of a teddy bear, sunflower, and other items in exchange. But Monkey’s single “sock with a star and a perfectly shaped hole” piques Owl’s interest with its possibilities. Written entirely in dialogue, Bernstein’s story never diverts focus from the characters’ id-driven wants. Magoon’s digital illustrations slyly reflect the changing power structure—Monkey spends much of the book on the forest floor, looking up at Owl, but they swap positions when Monkey’s sock becomes the object of desire—while bringing big laughs through pratfalls and other physical comedy.